This region is the driest and most sparsely populated corner of Sumba. After a long dry period, everything looks dusty, brown and desolate. Sumba horses and Brahman cows seek shadow from the scorching sun under the few trees. When you visit this area from March after monsoon, the countryside is a lovely lime green. Tanjung Sasar, the northern tip of Sumba is uninhabited and barren; only on the mountain slopes some trees and shrubs grow. 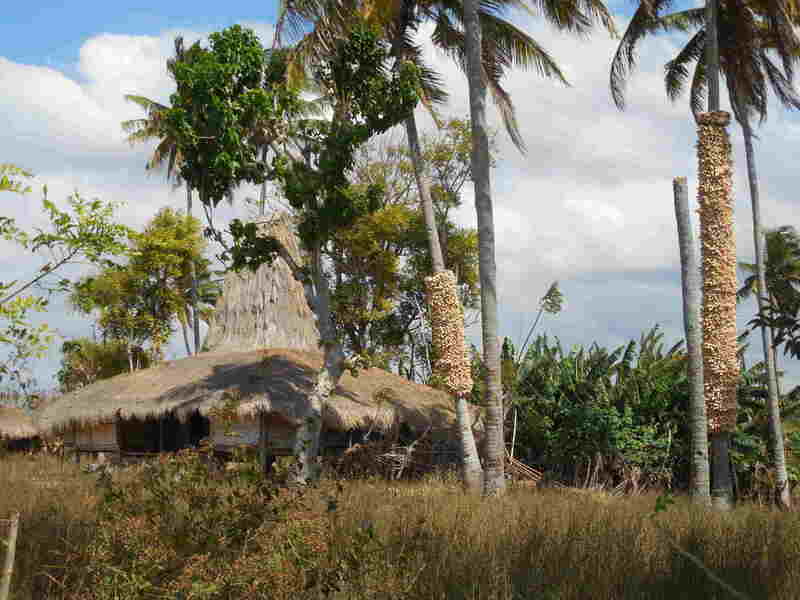 Wunga is the northernmost village and the oldest settlement in Sumba. It was set up sometime in the first millennium. For the people in Sumba Wunga is the source of their history – according to Marapu teaching ancestors of all Sumba people descended from this village. Either the ancestors came to this island by boat - or following Marapu belief by a ladder from heaven. It seems that time stands still there. Entries in the guestbook show that visitors come here only about once a month. Accordingly, you get received with friendliness by the villagers. The road there starts 7 km west of Kadahang behind at a bend. Some buses from Waingapu, which go until Tana Mbanas can stop at the branch but most busses stop already before at Kadahang. From there it continues on an increasingly bad road, ending as a path below the village. South of the main road is currently one of the largest sugar cane cultivation areas with artificial irrigation under construction. It is accessible halfway by an industrial road. Kadahang (Lapau) is a small sleepy village at the most north-eastern river mouth. On the north side of the bridge, on the hill, where the paved road turns to the west, a small track branches off. It leads to a traditional fishing village and the beautiful beach Larodak (Larawali). Further south, but 2 km before the Kanatang River bridge a rugged track, branches off to the inland. After 13 km you reach the traditional settlement of Kalamba, which lies in a wonderful green riverine oasis. You can bath in the river. Swimming through the river you can reach a small waterfall. Further south, in the Kanatang flood plain, is the traditional village of Mondu. 500 meters south of the bridge, or 2 km northwest from Kambera beach, at a marketplace, a bumpy road branches off inland. This road leads to the mountain village of Prailiang (Prainatang). After about 3 km you reach a point where you have a beautiful view over the river valley. The village is then opposite up on the hill. The village offers a great view around. 9 km further on this road you get to the traditional village Tanggedu. After another kilometre on a path you reach the cataracts or the Tanggedu waterfall. It is hard to believe that there is so much water here, that it can form the rock. From there it would be 6 km to the first southern settlement Ndapayami and onwards on a road to the road Waikabubak Waingapu. After 200 meter on the main road, a path branches off to the north. Here is a trail and view tower in the mangroves in construction. At the beach Kapihak a few simple beach bungalows are currently in construction. After 1 km you can turn inland to the traditional village of Padadita. The villagers do farming, keep cattle, and the women are weaving. After another kilometre you will reach Kambera beach. In Manangamihi a barely discernible path leads inland. After about 9 km and 450 meters ascent, you reach the abandoned village Hamaparengu. You can see the surrounding wall, megalithic tombs, a cannon and a giant boiler. It is difficult to find a local guide for this exhausting way. Another inland road leads from Londalima Beach with a 5 km steep climb to the traditional part of the village of Kuta in the mountains. From there you have a beautiful view of the beaches at the coast and to Waingapu. Paths go through the inland and terminate at the road Waingapu Waikabubak. In Temu, 1 km before the turnoff to the ASDP port, there is way inland to the waterfall Gunung Meja. The rocky track ends after about 5 km. On foot you must go along a water pipe down to the river and then through the river gorge. After 3 km you get to the waterfall, which pours into a beautiful turquoise pool. Hard to believe that in dry season there is so much water - in the monsoon season this way is not feasible. You can explore the northern inland actually only by motorcycle. Only a few small traditional villages lie in this savannah. There are three ways through the savannah: A seldom used but good road goes from Kadahang to Soru. A second road from Rambangaru to Lewa is not paved, really bad and therefore normally avoided. But you can use this road for trekking to the main road Waingapu – Waikabubak, where you can get picked up. The third way I described above: It leads from Mondu to Pambotanjaro, via Tanggedu and Ndapayami. Attention- paths in the reverse direction - from the main road Waingapu - Waikabubak northbound usually end where the cultivated land ends and the savannah begins.